KANE recently collaborated with Peerless Research Group on a survey of 252 top logistics and supply chain managers. The topic: workforce management in the warehouse. Check out the report. Solutions such as GPS systems and more real-time reports/metrics contribute to streamlined operations and cost savings, according to survey respondents. While one out of four shippers (26 percent) assert that their labor management tools are very effective, two out of three (64 percent) said they are only somewhat effective, and 11 percent claim their current applications are ineffective. When it comes to the use of formal labor management systems (LMS), roughly one out of five shippers (18 percent) currently have such a system in place, while another 26 percent use non-LMS technology software to manage labor productivity. Many shippers continue to feel that a lack of information about future volumes is increasing their labor costs. Maximizing productivity is one thing, but if poor forecasting makes it difficult to schedule the right labor to meet demand, productivity becomes secondary. Respondents talked about the need for better ways to give associates real-time information about their performance. Some discussed the ability to link associate productivity to the actual profitability of the account or the facility, so workers could see their role in a broader context. 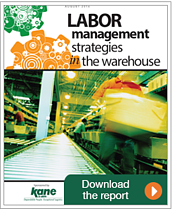 With labor cost pressures and management challenges not expected to wane anytime soon, companies that employ good internal strategies and/or turn to reliable Warehouse Labor Management will come out the clear winners over the next few years. In return, those companies will see benefits ranging from cost reductions and workforce productivity to improved customer satisfaction and more streamlined supply chain operations.